Anterior uveitis is an inflammation of the middle layer of the eye, which includes the iris (colored part of the eye) and adjacent tissue, known as the ciliary body. If untreated, it can cause permanent damage and loss of vision from the development of glaucoma, cataract or retinal edema. It usually responds well to treatment; however, there may be a tendency for the condition to recur. Treatment usually includes prescription eye drops, which dilate the pupils, in combination with anti-inflammatory drugs. Treatment usually takes several days, or up to several weeks, in some cases. Anterior uveitis can occur as a result of trauma to the eye, such as a blow or foreign body penetrating the eye. It can also be a complication of other eye disease, or it may be associated with general health problems such as rheumatoid arthritis, rubella and mumps. In most cases, there is no obvious underlying cause. 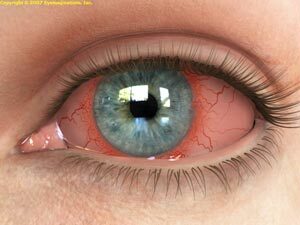 Signs/symptoms may include a red, sore and inflamed eye, blurring of vision, sensitivity to light and a small pupil. Becuase the symptoms of anterior uveitis are similar to those of other eye diseases, your optometrist will carefully examine the inside of your eye, under bright light and high magnification, to determine the presence and severity of the condition. Your optometrist may also perform or arrange for other diagnostic tests to help pinpoint the cause. For more information on eye conditions, visit American Academy of Ophthalmology EyeSmart.